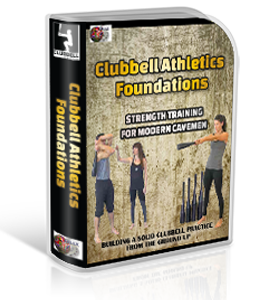 Clubbell Athletics Foundations is a comprehensive platform to work on the fundamentals of Clubbell training in a safe, engaging format. It is unique in the sense that it offers exposure to the vast complexities of the tool in an accessible, beginner-friendly layout. CBA Foundations was specifically designed for users to develop a keen awareness of structural integration and integrity beginning from the most basic level. Beyond the foundational practice, this program dives deep into the subtleties of Clubbell mechanics, focusing attention on the structural queues, grip nuances, and breath patterns that promote optimal adaptations. Every level, from basic to complex, will prove to be a humbling and revealing experience for even the most adept Clubbell practitioner. The Clubbell Athletic Foundations program has 3 levels. The package includes the product manual that has everything you need to get started with confidence, 60 tutorial-style videos teach you the specific warm-ups, activations, exercises, and cooldowns for each level, and 3 follow along videos to guide you though the 20 minute workout portion of each level.